Speaking of aperture and bokeh, one cool photography trick is to create a shaped aperture instead of the regular sphere or polygonal shape that you'll find in lenses. You can do this by putting a piece of cardboard onto the front of the lens with a hole cut out of it. If you make the hole small enough, say a couple of millimeters or so, it'll turn into your new aperture. You can shape the hole into anything you like and the bokeh will be shaped in the same way. The results are best if you use a lens with a large aperture, but you can get pretty good results even with regular lenses. 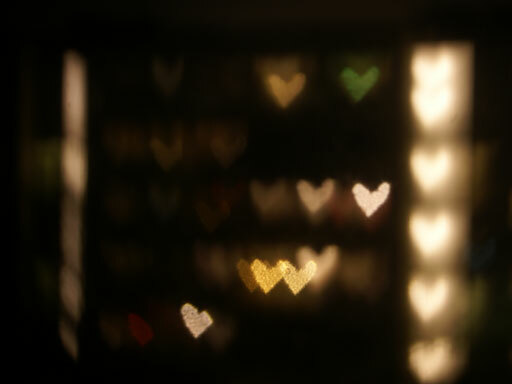 This is what I got when I took a picture through the window in the dark Swedish winter night with a heart shaped aperture on a standard kit lens. Yep, Merry Christmas and Happy New Year! I still like visit here every so often , I think you take nice photographs and such.